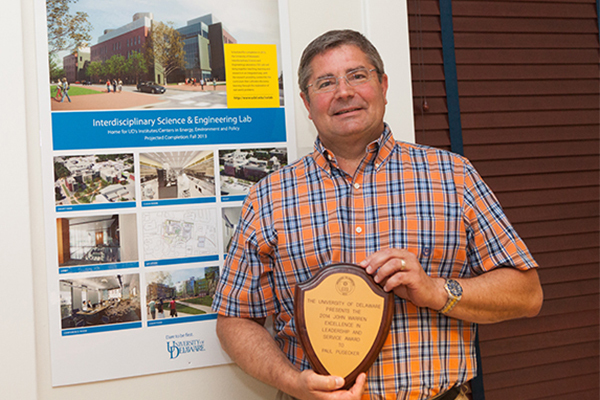 Paul Pusecker, senior business officer for the College of Arts and Sciences, has been presented the University of Delaware's John Warren Excellence in Leadership and Service Award. Paul Pusecker (right), John Warren Excellence in Leadership and Service Award recipient, with Doug Doren, one of several colleagues who nominated Pusecker for the honor. 1:44 p.m., June 12, 2014--Paul Pusecker, senior business officer for the College of Arts and Sciences, was presented the University of Delaware’s John Warren Excellence in Leadership and Service Award during a ceremony held Wednesday, June 11. The Warren Award recognizes significant accomplishments and notable contributions in leadership by University supervisory staff. The award includes a $1,000 gift. As the senior business officer for the College of Arts and Sciences, LaPenta said Pusecker plays a major role in many different administrative areas, including Facilities, Human Resources and Finance. “Paul is described as someone who cares about people while being able to get the job done, no matter how demanding the challenge,” LaPenta said. Doug Doren, the college’s senior associate dean for the natural sciences, was among several colleagues who nominated Pusecker for the award. 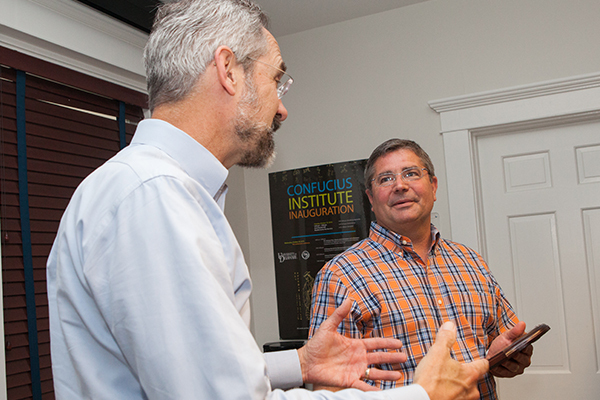 “Paul is an innovator and a leader who makes everyone around him more effective,” Doren said. A second Warren Award for 2014 will be announced in August.